My family will be arriving in San Pedro (port of Los Angeles) on the Star Princess ship on March 26, 2013. Our flight back to Singapore does not leave LAX until 11 pm the same evening. As such, we are rather at a loss as to how to spend the day while waiting for our flight. We will have quite a lot of luggage (4 large suitcases, plus carry-on luggage). There will be 2 adults, and 2 children (ages 13 and 8). I’m hoping you may be able to advise if you can cater for us on a tour around Los Angeles, or may be able to suggest an alternative sightseeing. Our guide can pick you up at 10:00 am from San Pedro Star Princess cruise terminal and start the tour. 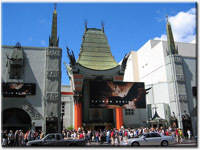 During the excursion tour you will visit Hollywood Sign and Movie Studios view from Mulholland drive ( two stops there, take pictures), Famous Chinese Theater, Dolby Theater, Hollywood Walk of Fame ( stop there, walk around with the guide), Sunset Strip, Rodeo Drive in Beverly Hills (stop there), some star homes in Bel Air, Santa Monica Pier (stop there). Along the way we can accommodate any requests you might have. Your luggage will safely store on-board our van. At the end of the tour our guide will drop you off at LAX . When you are ready with your shore excursion plans please fill out the form here, Book Los Angeles Tour . Our LA tour is an excellent way for sightseeing Los Angeles and surroundings.